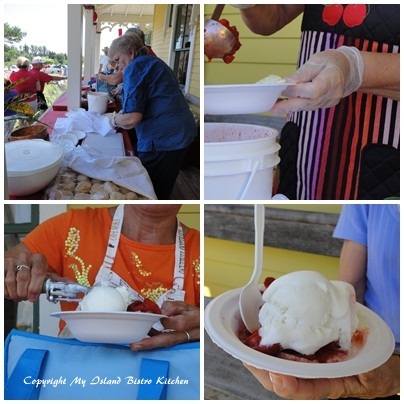 Summertime strawberry and ice cream socials (“socials”) are prolific on PEI in July and always herald Summer on the Island. From churches to community groups to historical museums to Women’s Institute groups, socials are common Summer events on PEI. Even local politicians gather around strawberries and ice cream and host Summer socials as a way of connecting with their constituents. Who would have thought strawberries would gain and hold such notoriety as the star attraction at so many local Summer social gatherings! 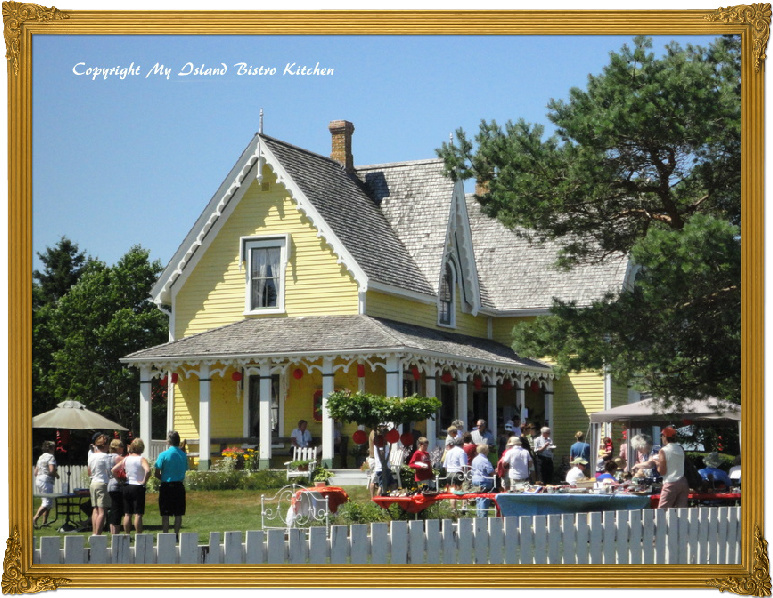 While I was unable to trace definite origins of these Summer socials on PEI, local historian and curator of History and Exhibits with PEI Museums and Heritage, Boyde Beck, tells me the earliest recording that he could find of such an event was in 1871 when the public was invited to a strawberry festival with refreshments on the grounds of the Wesleyan Academy, an event that also involved croquet and games for the young. Then, in 1896, there is a recording of an ice cream and strawberry banquet held after a 13-mile bicycle race from Brackley Beach to Charlottetown under the auspices of the Charlottetown Wheel Association. I think it would be safe to say that these early events would have involved homemade vanilla ice cream churned by hand in a wooden crank-style freezer and the strawberries most likely would have been wild as opposed to the cultivated variety. Today, most socials still follow the traditional strawberry shortcake recipe — a tea biscuit split in two with a scoop (or two!) of vanilla ice cream on top and drizzled with strawberries (usually crushed) and a dollop of whipped cream. Most often, a beverage is included (tea, coffee, or lemonade) and many organizations also offer homemade squares and cookies as well, particularly if the event is held indoors and if table seating is provided. You can expect to pay in the vicinity of $5-7 for the event. When they originally began, the primary purpose of the events was purely social — to bring together people in a community or church, for example, so they could get to know their neighbours or renew old acquaintances – hence the use of the word “social” in connection with the event. Apart from those organized by politicians for the purpose of meeting and greeting constituents, today’s socials are seen as a good way to raise money for organizations’ causes and some argue this is now more the key objective with hosting the events. My earliest recollection of attending an ice cream social was in the early 1970s. One July evening, my Mother suggested we go to a “Strawberry Social” being held on the grounds of Howatt’s Fruit and Vegetable Farm in Tryon, PEI, not far from the banks of the Tryon River. I have to admit, as a youth, I found it bizarre to make a connection between strawberries and something social! Nevertheless, off we went and I can recall it being a lovely, warm Summer evening and the beautiful manicured grounds with a canopy of several weeping willow trees on the lawns providing a lovely venue for the early evening event. Today, most socials are held indoors so that weather is not a restricting factor. 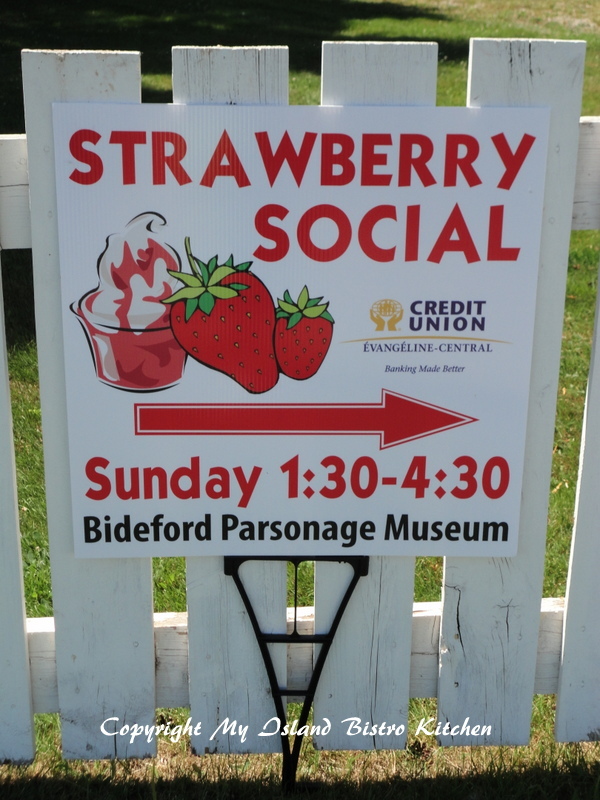 On Sunday afternoon, July 22, 2012, I was in Bideford, near Tyne Valley, PEI, in the Western part of the Province where the Bideford Parsonage Museum was hosting its 13thannual Strawberry Social. This house, now museum, was the former Methodist Parsonage where famed authoress, Lucy Maud Montgomery, boarded with Rev. John F. and Mrs. Ada Estey from 1894-95 when she was in her first teaching position at Bideford No. 6 School. 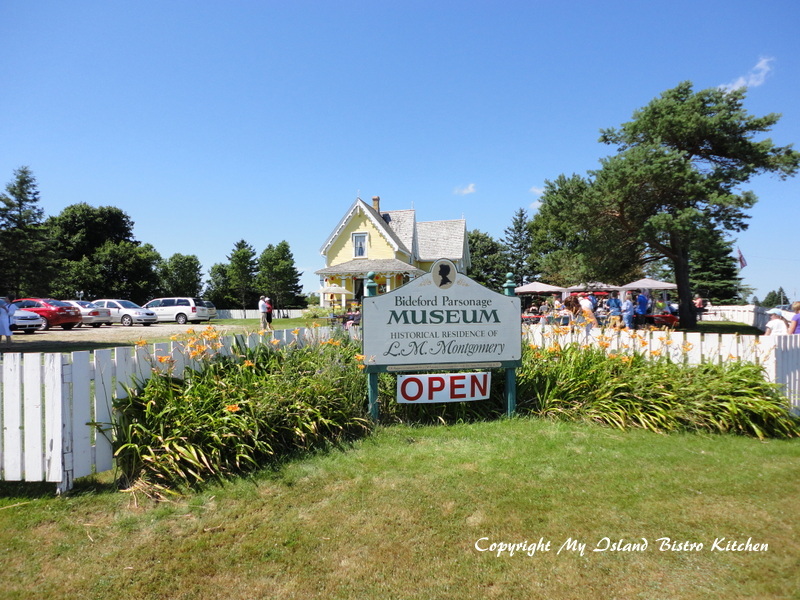 Members of the local historical society were blessed with a beautiful sunny day as they hosted the Sunday afternoon event outdoors on the Museum grounds. For the modest price of $5.00, visitors received a large bowl of strawberry shortcake, and tea, coffee, or lemonade. 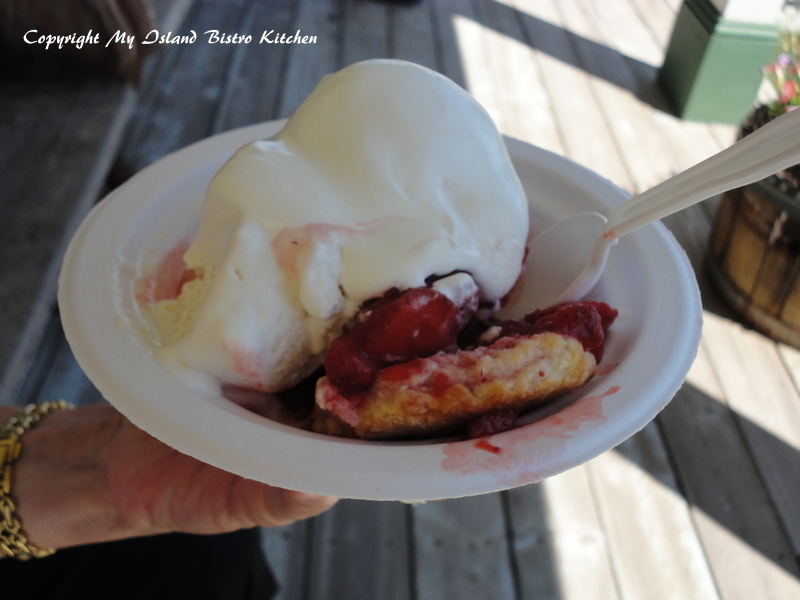 Homemade sweet tea biscuits, fresh Island strawberries, and PEI-produced ADL ice cream proved a combo hard to beat on a hot day! Local musicians provided the afternoon’s entertainment as hosts, in period costume, mingled about the grounds. While many churches, halls, and parks across the Island are the scene of socials throughout the Summer, the lovely designed and maintained Bideford Parsonage Museum with its immaculate grounds encased in a white picket fence sets a beautiful backdrop for a Summer social. 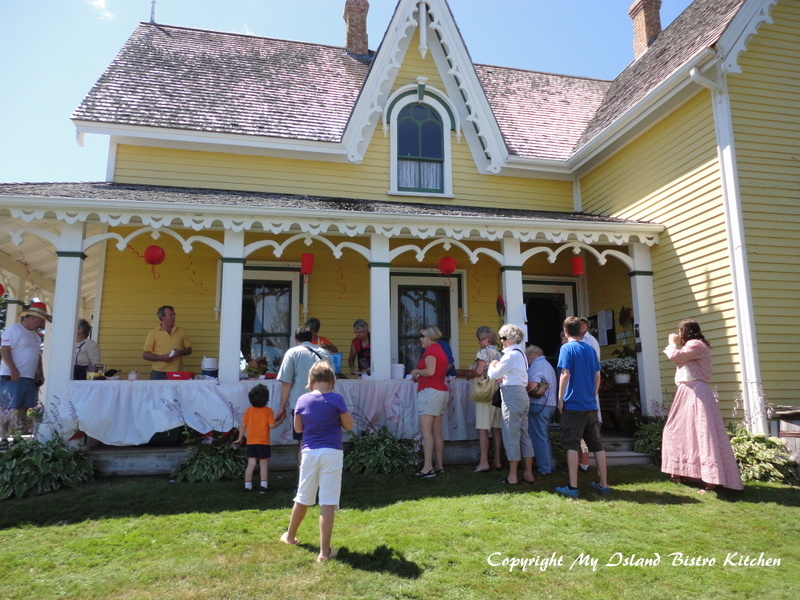 You can certainly let your mind wander to a more tranquil and genteel era when this kind of social would have been held in the late 1800s and you can easily imagine how such a summer social would have been a hugely anticipated event in rural PEI. On a sunny 28ºC Sunday afternoon in July 2012, ice cream and seasonal berries proved to be a perfect refreshing treat just as I am sure they would have been more than a century ago! 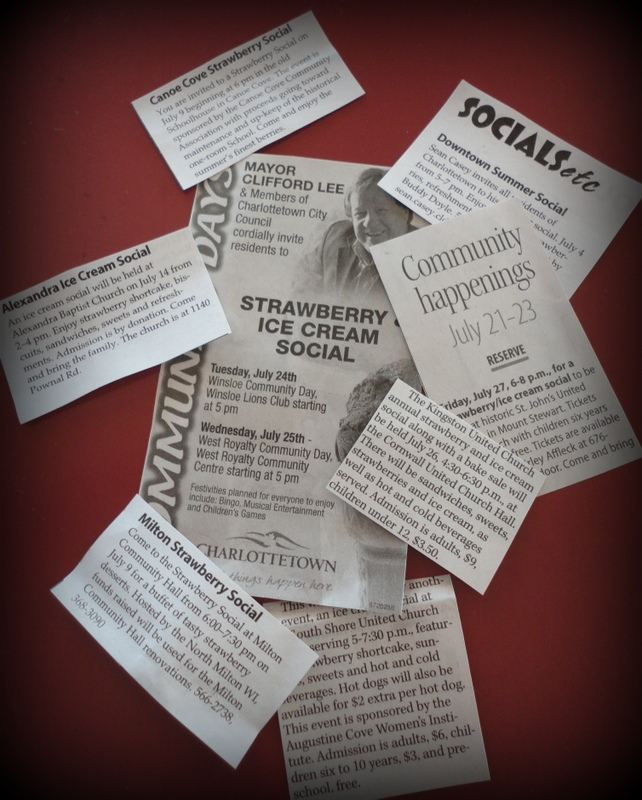 Lots of Strawberry and Ice Cream Socials on PEI! Whether you are a local Islander or a tourist visiting PEI in July, be sure to stop by one of the many strawberry and ice cream socials. On an almost daily basis in July, local newspapers carry advertisements for these events held at various locations across PEI so, no doubt, there would likely be one not far from where you are on the Island!